Apple claims that the PCI-e SSD in the new MacBook Pro is more than twice as fast as the 2015 model, and early benchmarking of the 13-inch MacBook pro with Function Keys bear out the claim that the new portable family from Apple is the SSD speed champion. Apple notes that the drive in either the 13- or 15-inch model of the MacBook Pro has sequential read speeds of 3.1 gigabytes per second. Write speeds are said to be 2.2 gigabytes per second on the 15-inch version, and 2.1 gigabytes per second on the 13-inch model. An OWC teardown and benchmarking session confirmed Apple's drive speed claims in the 13-inch model. 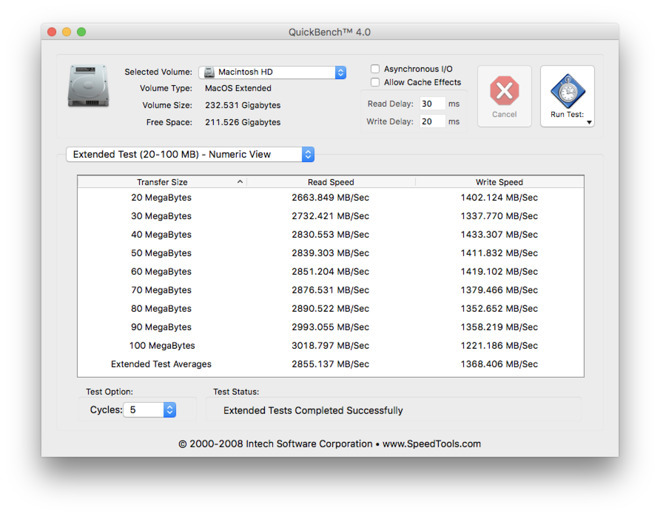 The early 2015 MacBook Pro that the new model replaced posted read speeds of 1.5 gigabytes per second, and 1.3 gigabytes per second writing to the drive. From a practical standpoint, copying a batch of mixed files has been noted as being significantly faster than its predecessor and versus other laptops in its class, with the 13-inch MacBook Pro with function keys pulling down 508.9 megabytes per second during the transfer, and the October-released Dell XPS 13 managing 339.3 megabytes per second. The fast SSD speeds will somewhat mitigate speed issues brought about for some users because of the RAM being limited to 16GB due to architectural limitations. Virtual memory page-outs will be relatively faster on the new SSD as compared to previous ones, further cutting back the performance hit induced by the transfer contents from very fast physical RAM to virtual space allocated on storage media.